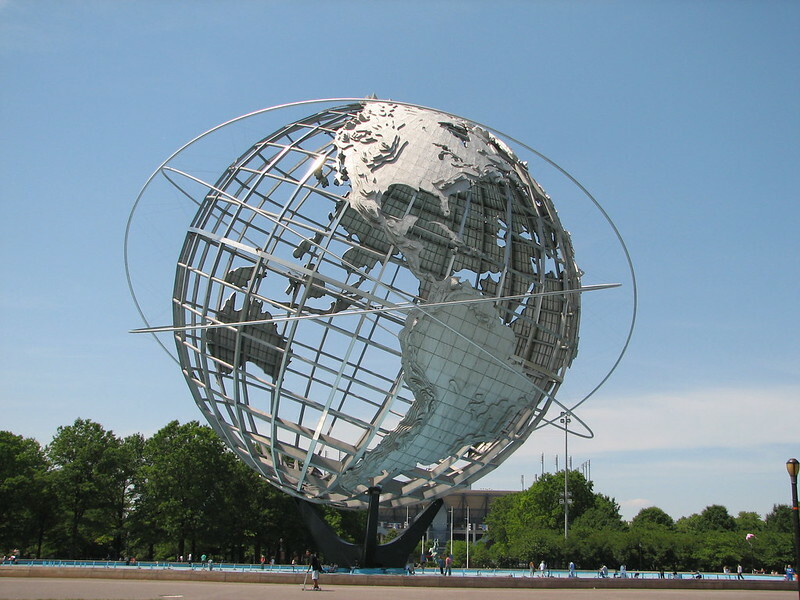 The Unisphere is a 12-story high, spherical stainless steel representation of the Earth. Located in Flushing Meadows – Corona Park in the borough of Queens, New York City, the Unisphere is one of the borough’s most iconic and enduring symbols. Commissioned to celebrate the beginning of the space age, the Unisphere was conceived and constructed as the theme symbol of the 1964–1965 New York World’s Fair. The theme of the World’s Fair was "Peace Through Understanding" and the Unisphere represented the theme of global interdependence. It was dedicated to "Man’s Achievements on a Shrinking Globe in an Expanding Universe". Image published by chrisinphilly5448 on 2009-05-28 00:31:22 and used under Creative Commons license.